We love senior dogs!!! And Maggie is a very special senior dog (she will be nine years old August 2). She ran in to some bad luck when her adopters moved into a small town house and could not take her with them. She had been in her home for over five years when suddenly she found herself without a home! When Maggie came in to our program, she was quite upset as any uprooted dog would be. 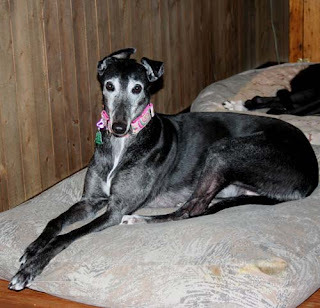 It took her awhile to relax but when she did, she turned into one of the funniest greyhounds ever! Maggie was used to being the only dog in her house; therefore, when she suddenly found herself surrounded by other dogs in her foster home, she had quite a shock! However, it didn’t take her long to decide that this arrangement was quite suitable and even more fun! Maggie has a very outgoing and happy personality. She has to be in the middle of everything. She certainly knows who she is and is very happy with that! She can walk into a room and light it up. She gets along with all of the other dogs in her foster home, although at times she can get a little snarky if someone invades what she considers her space. It’s very short lived; she may grumble a little and get up, turn around, find her spot again and before you know it, everything is just fine. We enjoy having Maggie here. She brings a lot of laughter and smiles. She loves going outside and heads right up the stairs in the yard to look down on the other dogs. It’s as if she is telling everyone that she is the queen! We decided that, if Maggie was a human being, she would belong to the Red Hat Society! She is a diva in her own right and does just what she pleases. Fortunately for everyone, it includes making everyone laugh out loud. Maggie is totally up to date on all of her shots. She has all of her teeth (Yay!) and her recent senior blood panel came back just perfect. She is supposed to be cat safe, but we have not done any testing. We love Maggie and we hope that some special person will notice her and give her that real “forever” home she so deserves. She is on Craiger’s List on our web site.